Long white threadlike worms sheltering in lower muscular flesh that is in contact with the skeleton. The female gives birth to them in water and they cause lingering and disabling swellings and ulcerations by perforating the skin of the ankle. This ailment is Dracunculiasis, a Black African and Middle-Eastern endemic which, by its frequency and its social repercussions, constitutes a public health problem. The agent that causes the disease is a variety of filaria, Dracunculus medinensis, or filaria of Medina. The female which alone is pathogenic resembles a "violin string" (Le Dantec*) from 0.5 to 2 metres long. After a long and silent sojourn in the organism, the worm gets down into the legs, perforates the skin and, when the body is in water (in the course of bathing, for example) emerges, liberating a multitude of embryos called microfilaria. They complete their development in the body of a minute freshwater shellfish, the size of a big grain of sand, the cyclops. Man contaminates himself by swallowing these cyclops with the water he drinks from ponds and wells. 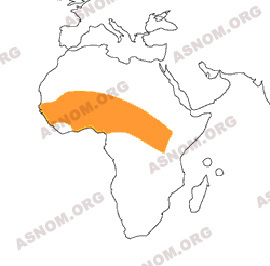 Affecting fifty million individuals in the world, this malady rages especially in West Africa and the Gulf of Guinea, whence its common appellation "Guinea worm". The Colonial Health Service, confronted from the time of its inception with this pathology, determines its geographical distribution, studies the symptoms and tries to hasten the complete extirpation of the worm, the necessary condition for healing. 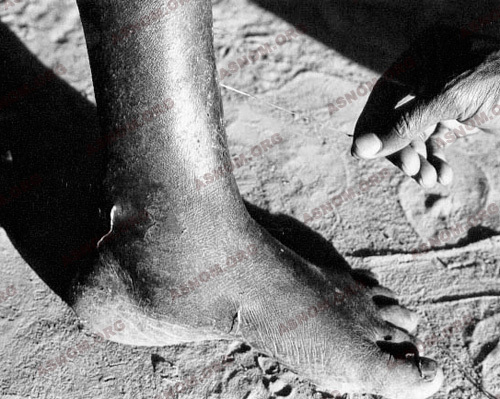 From 1898, in French West Africa (AOF), Bartet* in Dahomey and, a little later, Comméléran* in Mauritania, draw attention to the general symptoms that precede the withdrawal of the worm : filarial urticaria. Then, in the zone of the worm's emergence, there grows a painful tumefaction centred on a pseudo-furuncle which is soon torn apart, showing the extremity of the worm. From there stretches out, along the leg, a palpable, sinuous cord which is the substance of the worm. Superinfections are frequent, likely to cause serious septicaemia. In the 1920s, Trucy*, in Senegal, confirms that filaria are to be found predominantly in the lower limbs, in distal regions, feet and legs, sometimes the thighs and more rarely in other parts of the body. The same patient can be a carrier of many dozens of filaria. Walking and working then become impossible, making dracunculiasis a disease that has social implications. 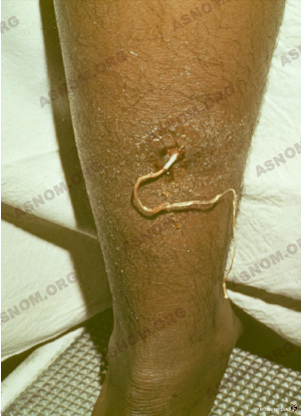 Piranne* reports in Upper Volta 15 cases of tetanus whose origin is an ulceration due to the Guinea Worm. Besides, there are "aberrant" localizations of the disease, the most notable being the scrotum. 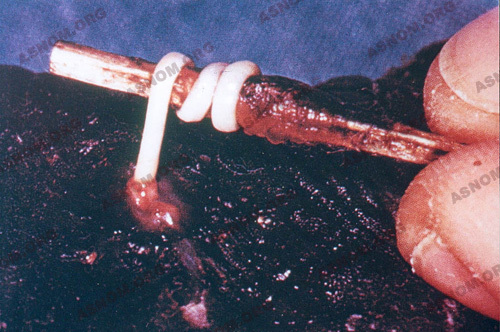 The extirpation of the worm being the purpose of the treatment, the indigenous method, called the Persian procedure, lasts for weeks : the accessible portion of the worm is rolled round a twig and, each day, it is pulled out slightly further, taking care not to break it, which could provoke phlegmons, even gangrene. The colonial physicians strove, without real success, to find more rapid methods of extracting the worm, either by surgical incision along the length of the worm's path or by pulling the worm out, after having killed it with an injection of mercuric chloride (Emily*, then Blin*) or anaesthetizing it with cocaine. Jeanselme* followed by Le Dantec* try general treatment with novarsenobenzol in order to kill the worm. From the 1960s onwards, active medicines to be administered orally are available, of which the first is Niridazole. Then the worms can and must be extirpated in a few days and the inflammation of the cutaneous lesions diminish rapidly. In every family, but also on the level of the community, the prophylaxis depends on the filtering of water. The filters may be quite uncomplicated. To eliminate the cyclops, a simple loincloth suffices. The traditional water sources are replaced by wells with parapet copings. Provided it is possible, with health education, to obtain the cooperation of the population, these measures are so efficacious that the worldwide eradication of the disease now seems possible. the year 2000. It now looks as if this expiry date will have to be postponed. - Joyeux Ch., Sicé A. : Dracunculose. p.394 in Précis de médecine coloniale. Masson et Cie Edit. 1937. Paris. - Muller R. : La dracunculose : épidémiologie, endiguement et traitement. Bull. OMS. 1979,57,6,903-910. - Carme B., Gentilini M. : La dracunculose ou filariose de Médine. Encycl. Méd. Chur. 8-112 A20. 4-1982.